— Congress chief whip Tara Prasad Bahinipati hospitalised; undergoing treatment at a private hospital in Bhubaneswar. — National Human Rights Commission issue notice to Odisha Govt over delivery of baby by minor schoolgirl. — NGT orders closure of illegal sand quarries in Subaranarekha River of Balasore. — Crocodile population in Bhitarkanika rises to 1,742 as compared to 1,698 last year. — A ST Cell delegation will visit the spot; to submit a memorandum to Odisha Governor: BJP ST Morcha president Rabi Nayak. — Boy injured in bear attack in Mayurbhanj. — Lesbian couple in Kendrapara threaten to attempt suicide if opposed. 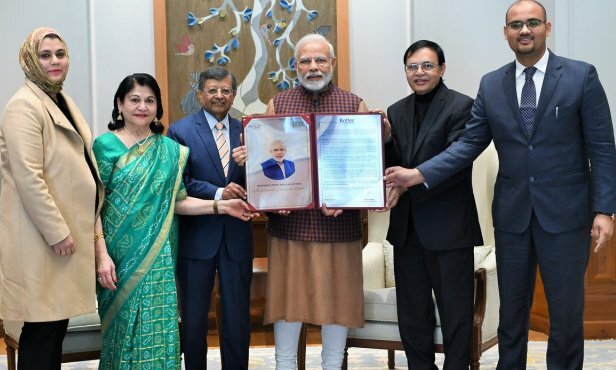 — PM Modi received the first-ever Philip Kotler Presidential award in New Delhi today for his “outstanding leadership”. — 2 injured, many feared trapped after a two storey building collapsed in Nithari village, Sector-31 in Noida. — Voter Awareness Forums will be set up in Ministries, Government Departments, Non-Government Departments and other Institutions to promote electoral awareness. — Rashtrapati Bhavan and Mughal Gardens to remain close for public from January 25 to 27. — Consumer Inflation down to 2.19 % in December 2018 as compared to 2.33% in November 2018. — Odisha beat Mizoram 4-2; win the U-17 Girls Hockey competition of Khelo India Youth Games 2019. Neha Lakra scored two goal 1st minute and 47minute. Nimaboti Singh scored two goal 17 minute and 45 minute.